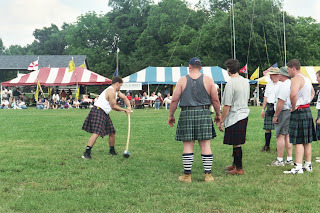 PHOTO: Shayne competes in the International Highland Games Competition, 2001). In 2001, Shayne discovered a new type of athletic competition - competing in a wide variety of events in a highland games competition. Being the only competitor without a kilt, we were quite surprised that first year when he actually qualified for the real event after demonstrating some of his "skill". (Then a fellow competitor gave him an extra kilt to borrow!) During the next year, he bought a kilt of his very own and he entered again in 2002, shortly before Christi was diagnosed. Of course that changed most everything in our lives and obviously put an end to Shayne's Highland Competitions. Well, all year he's teased, "I'm making a come back at the Highland Games as a 40 year old". What do you think? Well, good luck, this weekend, Shayne!! You never ceases to amaze me! Congrats to Lauren! This morning, at school, we gathered with the high school students, in the new school’s gym, to award the $1,000 Christi Thomas Memorial Scholarship and also an additional $1600 in smaller scholarships. For all who have donated to Christi’s Memorial Fund, please accept our deepest thanks. 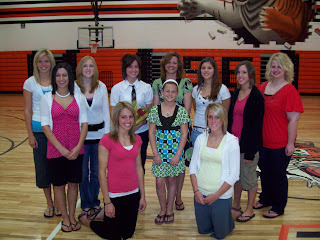 Although very hard emotionally, it gives us great comfort to be able to let others “live on” through Christi’s memory. I must admit that we struggled while reading and evaluating every applicant’s essay, application and letters of recommendation. It’s just so hard knowing this is all taking place because Christi is dead, and it also reconfirms the fact she didn’t get the chance to grow up and live like so many other young people. Regardless of my own self-pity, there were incredible applicants again this year! The Scholarship Committee selected Lauren as the $1,000 winner and we added some “book scholarships” because Christi loved reading and because there were so many great applicants! Congratulations to: Brittany P., Brittany E., Ashley, Andrea, Amber, Brianne, Haley and Danielle on their $200 book scholarships. We wish them the very best for continued success and happiness! My opportunity to move forward in life and to pursue more education is an extremely exciting one. In my pursuit, I know I will need support and comfort and am not afraid to ask for it, as it has been asked of me countless times. Therefore, I request your consideration of a scholarship in memory of a child who would certainly do the same. Most children do not realize the significance of the gift of learning that has been given to them by their parents and teachers. Until they are mature enough to appreciate its importance, students usually take school and the care of everyone around them for granted. 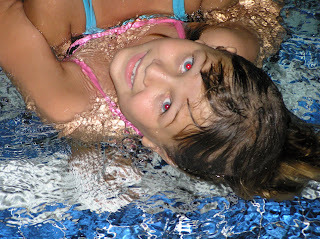 Christi Thomas, however, grasped her admiration of this big world at a young age and at the toughest time of her life. I am at a point in my life where I now realize how fortunate I am to have a family who would do anything for me and to have community members who have provided education, church, libraries etc. As in Christi’s story, life is not guaranteed, but it can be a fulfilling adventure no matter how long we are here on earth. 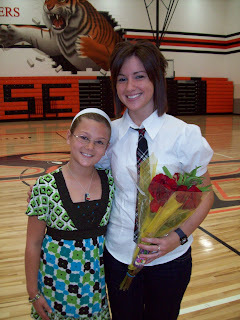 Here’s another: Christi was a very caring person and she was very brave and hard working. Anytime I was around her, it was obvious that people knew she was involved with things any chance she had. In the short time I knew her, the qualities she displayed and the type of person she was showed how great of a person she really was. She was one of those kids who loved to be involved and who loved to learn. Throughout her life, she did so many things and affected so many people. 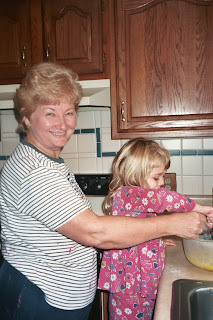 She taught me you can’t take life for granted and that every day is a blessing. As Christi displayed to many people, she never gave up and she always tried hard. I hope to take this with me in whatever I do and I hope that I can make the best out of my life. 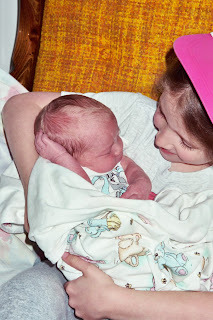 PHOTO: Lauren (little one in the middle) meeting newborn Christi Thomas at the hospital. I still remember their family bringing Christi a darling little white outfit, with red little rose buds on it! IRONICALLY: As we were giving away scholarships today, I learned this afternoon that I am receiving a $1,000 scholarship to help pay for my OSU tuition costs next year!!!!! I'll write more about that later, but I thought today's timing was very interesting as I struggled much of the morning trying to stop my tears which start pouring out as soon as I opened my mouth to present this morning's awards!! 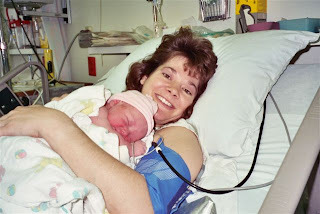 Ashley holding newborn Christi (with help from Grandma Nonee) May 1997. Shayla with Ashley at the Graduation Party, Memorial Day Weekend. We are so proud of our niece! She's graduating with a 4.57/4.0 GPA (due to all of her advanced placement and honors classes). Although accepted into the Honors Engineering program at Ohio State, she unfortunately selected a rival to the Buckeyes! Along with Ashley's graduation present, we gave her one of Christi's colorful (bright animal prints) pillowcases to take with her to college, if she wants. (Christi absolutely adored Ashley!!) Ashley seemed to like it and since she's going to an out-of-state college, it may help keep her from being homesick next year. Best wishes, Ashley! 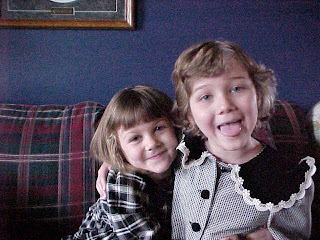 (PIC: May 2004, joking sisters!) While I try not to follow too closely, because it is so sad, our earthly world lost a couple of very special ones. Emily (a twin, oh how this disease likes to strike twins) died on Chrsiti's birthday, May 12th at the tender age of seven - her twin sister now scared to sleep by herself. Spencer died today. Diagnosed around the same time as Christi, I exchanged many emails with Spencer's dad. And for the final kick in the pants, research has recently discovered that the shots (GCSF) Shayne used to give Christi in the hospital (with great anxiety for all, but Christi only wanted Daddy to do it) MAY actually increase tumor growth according to a recent study. Oh, I'm terribly, terribly sickened as I remember many tears and her great fear with each and every shot she had to get; poor little thing probably knew it was making the cancer grow even faster! Oh, why, oh, why, oh why????!!!!!! What would we do without Shay? 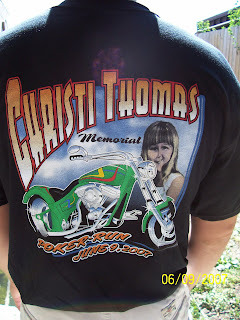 Much to our surprise and delight, the "Friends of Christi" are again holding a fundrasier for the Christi Thomas Memorial Fund by sponsoring a Poker Run. The 6th annual event will take place on Saturday, May 31st. Registration is from 10AM until noon. The motorcycles will head out at noon. The registration location is at the Tiffin Moose #846 located at 1146 N. State Route 53, Tiffin. Stops along the way include: Town Tavern (Clyde), Cove Inn (Whiteslanding - on Lake Erie), Legendz (Fremont), Blue Eagle (Bettsville) with the return back to the starting location at the Moose Lodge. The cost is $10.00 per person which includes dinner, door prizes and music. For those looking for a great inexpensive dinner (only) the carry out meals will be $5.00. Top Hand for the Poker Run will be $250.00 with the 2nd hand prize of $150 and the third $100. Music will be provided by "Five Finger Dizcount". We hope you can attend! Our deepest thanks to many who helped us through Mother's Day and Christi's Birthday. Although it was anything but a "celebration" the Grants sent us TastyCakes from Philadelphia (Christi loved them) and I shared them with my teaching colleagues the next day in honor of the birthday. Shayla's teacher grew up in Philly so she was equally excited. We received some lovely cards, donations were made to her memorial fund and a friend of Christi's (who happened to be a boy) left the sweetest message on our answering machine, much to our shock and delight! Thanks to all who helped us by letting us know you care! Your love means so much! THANK YOU! 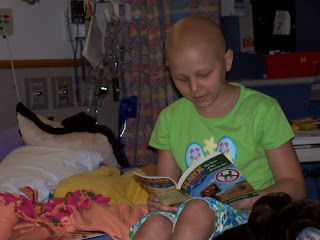 Right before Christi's birthday, a sweet blogger keyed me in to some breaking news about neuroblastoma. The next day we heard of this wonderful news from Dr. Maris. I can tell you that the news was VERY comforting to me! Doctor Maris and Dr. Kushner, Christi's NYC doctor (and others) discovered that neuroblastoma is caused by genetics! That news I can handle! If it would have been determined to be environmental factors, I don't know how I'd be doing today. I had hoped for so long, it was caused by a genetic fluke - and it is!! For YEARS, I have wondered and worried that I did something to give Christi cancer. Everything I read, did not have an answer, but lead me to believe children's cancers are not usually environmental because the children are so young. Despite that information, I still wondered if I ate or breathed something wrong when I was pregnant, or if I pushed her stroller where they were spraying pesticides when she was a toddler or what. My mind went on and on and on. I vividly remember a conversation with "Angel" Emma's mom at the Ronald House in NYC about this. We thought one day we would know, but I really did not think "one day" would be SOOOOOOOO soon! I do feel like there is a weight off of my shoulders. (And it's such a fluke, there is no need to test Shayla.) Now, we just need to find that cure! Hopefully, once again, "one day" won't be so long! Here are some articles and a great little video clip, showing Dr. Maris and Anna taking about this new information! (Alex Scott is also featured!) Christi treated with Anna in NYC and we met her and her family in Chicago. She was her high school Valedictorian and has been battling this disease since she was 18 years old! (Neuroblastoma goes very slowly in adults.) Best wishes to Anna! Thanks to Dr. Maris and all! It's Genetic! I rejoice! I most likely shouldn't post this since I did not ask the 16 year old author for permission. Her beautiful mother, my friend, mailed a copy of what appears to be a journal entry and I thought it was incredibly sweet and thoughtful. Is the reason I'm not asking for permission because I do not want to stir up or bring up sad memories for others? 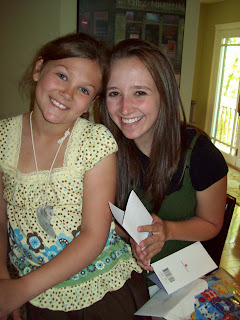 Sunday, May 14, 2006: After Christi’s party last night, my heart was nearly breaking in two. It hurts me inside to think of such a perfect, beautiful young girl. The cancer has spread throughout her entire body. Could you even imagine? Not having the chance to grow up, and drive a car, date boys, be silly with your girl friends, play in the park with your dad, get nervous about tests…anything? It’s unfathomable. I watched last night as Christi sat down with her plate of snacks and closed her eyes to pray over the couple carrots sticks, cake and ice cream. From my seat, I felt like the world slowed. Everyone else was rushing around and laughing and I was sitting and watching her. She prayed quietly, her lips moving to herself, then put her head up and cracked a joke with one of her friends. I just stared for a moment. I don’t understand sometimes why life is so unfair to those who deserve most to live life to the fullest. Do they really deserve to be punished by God? Or does he have a bigger reason for their lives? I just can’t even begin to ponder about it. She’s so beautiful and my eyes burn at the thought. Why her? Christi blessed her mother’s life so. I know Angela counts every day with her daughter a blessing. 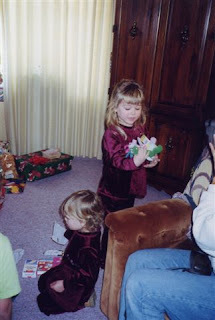 What Shayla did not know was that Christi absolutely hated her gift to me that year so she hid it under her bed and made me something different when she was eight in 2005. I loved it and didn't understand why Christi didn't like it, but Christi said she messed up on it and it was terrible. Little did she know I got it out from under her bed and I myself hid it in a bathroom cupboard until about 4 months after her death. 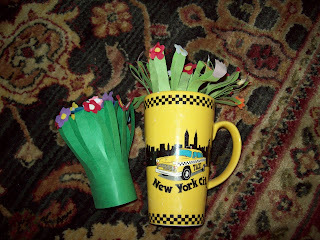 Ever since then, her bouquet of flowers has been sitting in my NYC cup in our bathroom. I knew it would eventually get faded and destroyed in our bathroom, but I was willing to have that happen to get to enjoy it for a bit. This morning I realized just how faded Christi's is and Shayla loved hearing the story about her sister. 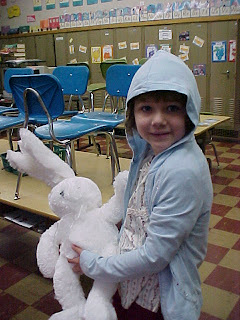 (PICTURE: 2004 in my old kindergarten classroom after school) Christi got me good Sunday! There was no way I knew I could make it out to the cemetery on Mother's Day or her Birthday. Because of the incredible amount of work I have to do for my final classes right now, and the large amount of laundry I needed to catch up on (We recently had to put in a new well. Thankfully, our water problems are now over and I'm no longer showering at the YMCA in the mornings, but it was a long, crazy, expensive month!) we drove separate to Carey to take my mom (Nonee) and Joe out for lunch. (If you are close by, make a trip to "Moreno's" downtown. It was fabulous!!) I didn't know the way so I followed Shayne. He was then taking Shayla off to Crestline to visit with his mom (Nee Nee) and grandma while I headed back home to study. I said I would follow the TomTom (GPS) Shayne's mother bought us for Christmas and see how that sent me back home. About 15 minutes into my journey, I realized I was going to go right past the cemetery. How could I drive by and not stop? Never. 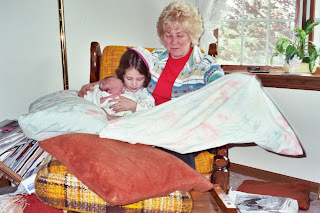 I pulled in, chuckling to myself that Christi tricked me into coming to see her on Mother's Day, despite the cold rain and the fact I was muttering to myself, "I should be visiting my grandma's grave NOT my daughter's!! This is so wrong!" Shayla & Nonee (Mother's Day 2008)There was another sweet, sweet surprise that really got to me too. In my van, I had flowers to put on my Grandmother's grave. Pushed into the ground on Christi's place were the same, exact flowers I bought for Grandma!! Wild, eh?! 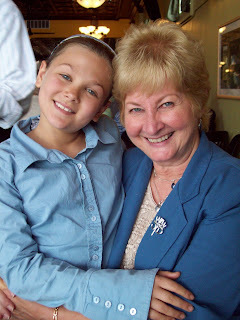 Christi & Grandma have matching flowers! I have no idea who was the sweet angel on earth who put them there, but thank you so much! (They were not there late Thursday afternoon.) Oh, I could hear Christi giggling and that is a wonderful thing because I sometimes worry that I will forget the sound of her giggle. And what a great giggle she had!! Work was a killer on Friday. 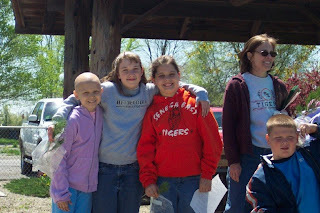 The sixth graders returned from camp and I couldn’t shake the feeling that we should be whisking off all of the girls for a 11th birthday celebration – something grandiose that would last all weekend as we starting doing after Christi was diagnosed. Additionally, my sweet colleague was talking about her daughter’s birthday celebration, as her daughter’s birthday is two days before Christi’s. I do not think she knows about Christi’s bday on Monday and I just smiled and asked her questions about all of the festivities. Friday night led us to the barn to work with Skeeter. (Thankfully, Shayne is home and is on “horse duty” because quite frankly, despite my good faith efforts, the 1,000 pound animal is just too much for me!) It was at the same barn, two years ago, where all of the girls from Christi’s class gathered to ride horses and celebrate her 9th birthday. It was wonderful! That, combined with the cold, damp weather, made me go sit in the van and put my head back for a while. I’ve not been sleeping well and I was able to doze for a bit. I know things will get better, but right now it’s like I’m haunted and consumed. 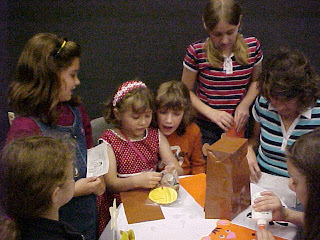 (PIC: Christi with some of her friends at her 7th birthday party. Did we really rent The Ritz and fund a puppet troupe from Cinci?! You bet! Would we do it again if we could - YOU BET!! She was worth every penny!!! )Saturday, we went to a Horse Show at the fairgrounds so Shayla would learn what she will have to do in July. It lasted for hours and she had a ball. (I enjoyed watching some of our school's students ride and give Shayla some pointers.) At the fairgrounds over the weekend, we were able to see a couple of Christi's sweet classmates. They are so sweet! They came right over to talk with us! Returning home Saturday evening after attending a fundraser for a sweet lady who helped out at many of Christi's fund raisers, I found the sweetest phone message. One of Christi's freinds call to say he was thinking about us. I absolutely coldn't believe it. I sat down and cried. God's people are amazing and are continuing to get us through! Perhaps if Mother's Day and her Birthday weren't back to back, it'd be better. I feel like this is a double whammy, yet I do indeed count my blessings as I know I have more than most!! Additionally, I think what is so hard is that the days fell exactly as they did back in 1997. Mother's Day was on a Sunday and Monday morning at 8:13 AM, the 8 pound 4 oz. perfectly healthy baby Christi was born. 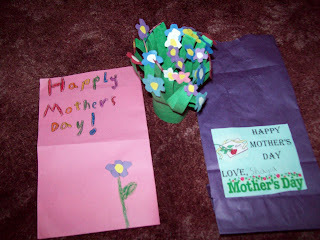 FUNNY: I'll never forget Mother's Day of 1997. We took our moms out for a buffet dinner. While waiting in line, the carver held his knives way up in the air and loudly sharpened them, right in front of me, the one 9 months pregnant going in to have a C-Section in the morning (because Christi's was breech, just like her sister and father). I couldn't eat much then as I worried that the doctors would be doing that in the morning before they sliced and diced me like the ham to get Christi out! 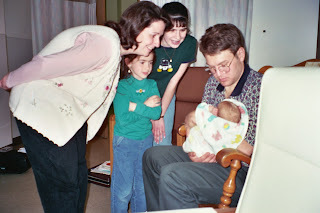 (PIC: Monday, May 12, 1997: Holding Sweet Christi for the very first time. )Scholarship applications are rolling in as the due date of Monday, Christi's birthday, nears. It is such a bittersweet feeling. It gives us tremendous pleasure to be able to award scholarships in Christi's memory, yet our hearts absolutely ache knowing we cannot host Christi's graduation party nor help her pick a college to attend. We are so grateful for all of the generous donations made to the Christi Thomas Memorial Fund to allow us to be able to help others in Christi's name. http://active.com/donate/christirun (or click on the "red" type under today's title). We've been very touched by the sweet words left and the generous donations. The girls also brought me an absolutely breathtaking bouquet of roses, knowing how hard Mother's Day, followed directly with Christi's birthday will be. So thoughtful! I pulled out two pink roses and took them to school today. I know Monday is going to be very hard to be at work. The flowers may help remind me Christi is not forgotten and she is where I want to be. Thank you, Olivia & Jennifer! As I sit here experiencing another sleepless night with this headache that just won't quit, I find myself reminiscing about the "good old days" with Christi. 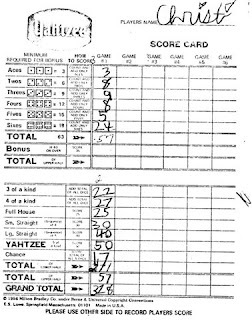 In the spring of 2006, when we were traveling back and forth to Philly so often (trying to give her a "normal" life yet also having to treat for her rapidly progressing cancer) I often traveled with a few "Yahtzee" sheets and five dice. I could pack the game in a small plastic bag and it would provide us with hours of fun. I also sit here tonight and laugh at the first time Christi filled in "the bottom" of the game sheet. Christi was four years old and I had a meeting so my mom was to take the girls to the YMCA to drop them off for the "Pee Wee Club" two hour preschool program. When I got there to pick them up, Christi and my mom were sitting in the lobby playing "Yahtzee". I asked, "What are you two doing out here?" 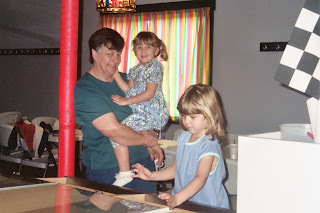 My mom explained that Christi felt she was just too old to be in the little kids' preschool program for the afternoon so they spent it together, played games and were waiting for Shayla. Christi proceed to tell me that she was old enough to do the math on the bottom part - something I would never let her do when we played together. I was stunned that she was able to calculate like that at such a young age and I shook my finger at my mom for letting Christi take the day off. Now, of course, I am so glad she did because it gave us yet another funny little memory of Christi. With delight and surprise, I learned tonight after we got back from taking care of Skeeter at the barn, that the Tiffin Art Guild will be doing a fundraiser in mid-June in Christi's honor. They'll never know how touched we are!! 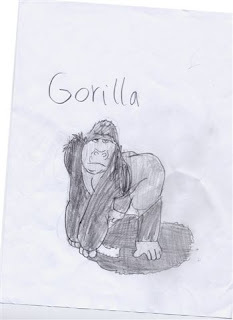 This is a sketch Christi did in the summer of 2006; her drawing talents were simply amazing. Tonight, as we tried to go to sleep, Shayla cuddled next to me and told me that Christi was the very best artist and no one could draw like she could. 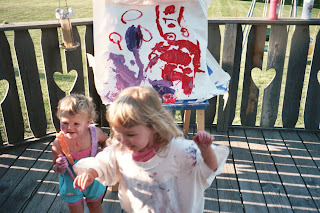 I reminded her that Christi took such joy in making pictures to give to her. 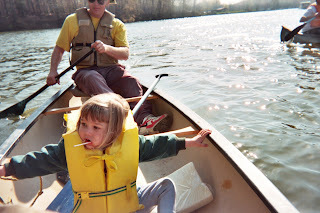 (PIC: Christi in Uncle Jeff's canoe.) While teaching today, I watched all of the sixth graders march by my door, carrying their things heading off to 6th grade camp. It's always a wonderful time for our students and my heart just fell as I immediately realized Christi was not going with them and she would have loved it. They start selling items when they are in the lower grades to help pay for their camp. I know Christi didn't have much in her account, as we didn't let her go door-to-door because people were already too kind with the many fundraisers to help pay for her treatments and travel, but it still brought many memories forward in a rush as she came home all excited from the "kick off" selling programs at school and I'd have to explain to her that she could sell to mom and dad, Shayla and her grandparents only. I don't know if she was old enough to "get it" or not, but I told her that each year as I prayed she'd really get to make it to sixth grade to get to go. Sadly, she didn't. It was a really odd feeling today and I just had to keep on teaching, pretending nothing was wrong while I really wanted to scream. I do hope they have a fabulous time and that Christi watches over them and keeps them safe. They deserve that! Things are always more challenging when Shayne's out of town. This week he has been deep sea fishing off of the Gulf Coast of Florida with the guys from work. In year's past, they took him as their banker, now they take him as a colleague!! His new job, over the past eight months, has been a tremendous blessing, filled with amazing opportunities and hard working colleagues! Thankfully, he will be home before Christi's birthday on Monday. I didn't think it'd be hard this year, but my anxiety level is going up each day. One of my Professors wanted to meet with me on Monday and I had to tell him no. "It would have been my daughter's 11th birthday, but she died and I just don't know if I'll be emotionally able to talk about my work on May 12th." He picked a different day. Whew! I was surprised how challenging the dance photos were for me! While Shayla had a splendid time enjoying the company of her friends, my heart just ached as soon as I heard the photographer say, “Sister pictures” and many of the girls, along with their sisters, posed for their photos. I said to Shayla as we watched, “Remember always getting your picture taken with Christi in your dance costumes?” She nodded. I managed to get over it and then as we were packing up, what would have been Christi’s class started arriving in their lovely outfits. Ergh, it just set me back. Sometimes it's just too hard! As I sat through one of Shayla’s dance classes earlier in the week, the teacher was determining what to do with the girls’ hair. Of course, I was probably the only mom saying, “Whew! I have one with hair; this is great!! 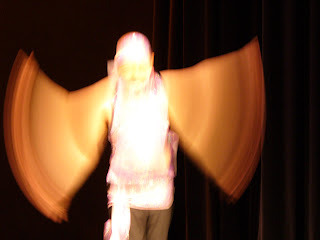 The bald thing may have been easy, but heartbreaking!” One little girl, from Christi’s ballet class said, “When Christi was alive we all put our headbands…..” She froze, as her little eyes caught mine, and then she said nothing, but immediately turned away. I stayed after class to give her a little hug. I thanked her for remembering Christi and told her that she made my day by saying Christi’s name and remembering her and how they wore those headbands, so Christi wouldn’t feel left out that year, was so kind. We picked up Nonee and Paw Paw and headed off for the long drive to Will’s First Holy Communion. Now one must realize that it was also the same exact time as the Kentucky Derby – something our family has been looking forward to since January when we visited Churchill Downs in Louisville, KY. A venue we had given serious consideration to attending in person. Each night we had been watching Internet video clips, seeing how the odds were changing, reading newspaper stories about it and picking our personal favorites. Shayla, selecting by the best odds – selected Big Brown. Shayne was rooting for Recapturetheglory and Pyro was my favorite. As we neared our location, Shayne asked Shayla if she wanted to go to the restaurant with the big screen TVs to watch a little pre-Derby information or if she wanted to go to her cousins before church. When she said she wanted to watch the Derby instead I wasn’t surprised, even though being at her cousins is always at the top of her list. The Derby had been HUGE at our home in recent days. This morning, Shayla and I checked out all of the Kentucky Derby coverage we would find. As she sat on my lap, both of us crying, she finally said, “I think we’d both feel better if we went out and spent some time with Skeeter this morning instead of this evening after my 4H meeting.” I told her I too thought that would help us cope with Eight Belle’s death so we drove out. In the barn, praise and worship music blared and together we groomed Skeeter and got him ready for Shayla to practice showmanship with and to ride. It was the very first time I was actually able to get close to a horse. As Shayla wheeled the barrow full of "you know what out" to another barn area and dumped it I could only chuckle to myself, “Why doesn’t she like to clean her room, but doesn’t mind cleaning a horse stall? This is so much worse!” Today I learned another good horse related lesson (just like not wearing sandals around horses). Don't wear white pants to the barn! As Shay and I tromped through the muddy pasture out to get Skeeter, Shayla looked back at me, while I was carefully trying not to get muddy, laughed and said, "Good job on the footwear, but next time don't wear white pants!" God bless us all! (This little one made my day. During photos, her sweet mom came up to me and said, "Megan wants to have her photo taken with Shayla." Megan donated her hair to Locks of Love a while ago in Christi's honor.) What a tiny sweetie! Shayla's school picture - my how school pictures have changed over the years! I'm not certain why the blogger monster is acting up again - randomly striking out photos, but I just scanned a few more and I hope they'll work! (Fingers crossed.) 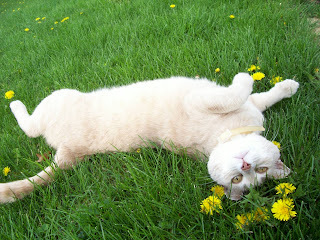 Shayla snapped this picture of Buttercup and I thought it was so cute. I still wonder (especially when I see the cat hair in the house!) how and why this cat outlived it's owner, ergh! Sometimes I still want to scream about it all. 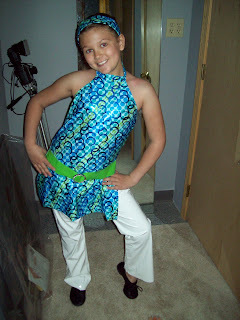 Tomorrow will be dance recital pictures. Of course, I still vividly remember that day two years ago (a delightful treat that Christi was actually home from Philly and well enough to make the pictures. She was so into her "Hank the Cowdog" books that she could hardly get her nose out of her book while friends from her classes were trying to talk to her. I finally whispered in her ear something like, "Put your book down now; you're being rude!". 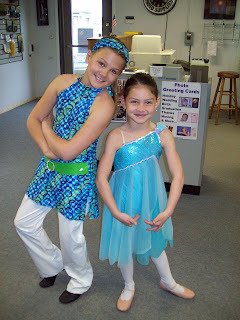 Shayla's ballet and jazz recital for Dance Unlimited is on Saturday, June 7th and Sunday, June 8th. On Saturday we will award this year's $1,000 C.T. Scholarship Winner. I will need to order our block of tickets soon, so please let me know if you want me to get tickets. Just email me at zzartset@bright.net THANKS! Now that our lease with Skeeter started, Shayla's responsible for cleaning his stall. Thankfully, the stable is incredibly close to our home. Kelsey worked with her after school today and Shayla was loving it all! Many thanks to all who have made a donation to Christi's Memorial Fund by purchasing the "Tea Time Packets". Olivia has been very busy and I've received many lovely comments on the treats - thanks everyone! The due date for the three $1,000 Christi's Scholarships (Fremont St. Joe, Seneca East, & Dance Unlimited) is Christi's birthday - May 12th.